I love it when the weather is great – pushes me outside, and off I go exploring. This time, seeking some respite from the hot sunshine a couple of weeks ago, I headed out to the east side of The Hague to explore the Landegoed Marlot. 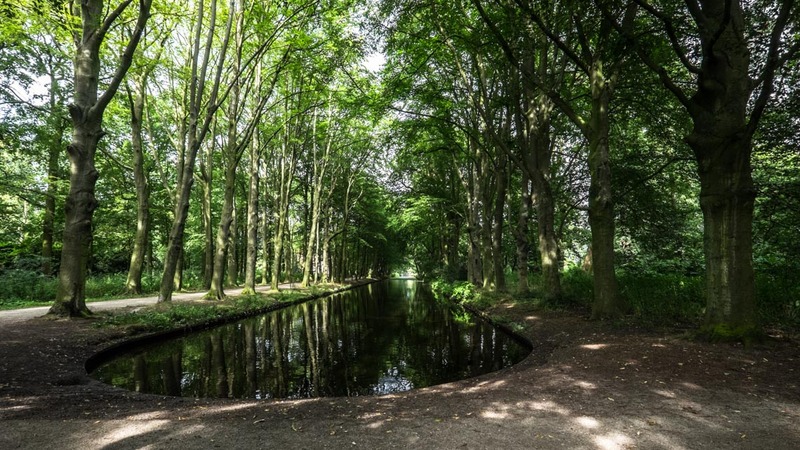 Here you find shady woodland divided by canals and several stone monuments influenced by the classical era. At some times of the year, the park is teeming with wildlife and woodland flowers. At any time of year, however, it is a haven of peace and tranquility. So take an adventure with me in the woods, by bike, or on foot, and you will be surprised at what you find. Situated between the Bezuidenhoutseweg and Benoordenhoutseweg, this area of woodland stretches from The Hague central station to beyond the Louwman Museum. The trip takes one through the Malieveld, Haagse Bosjes and Landgoed Marlot. In addition to the large expanse of densely wooded area, you will also find yourself wandering past the Huis ten Bosch, one of the three Royal Residences in The Hague. 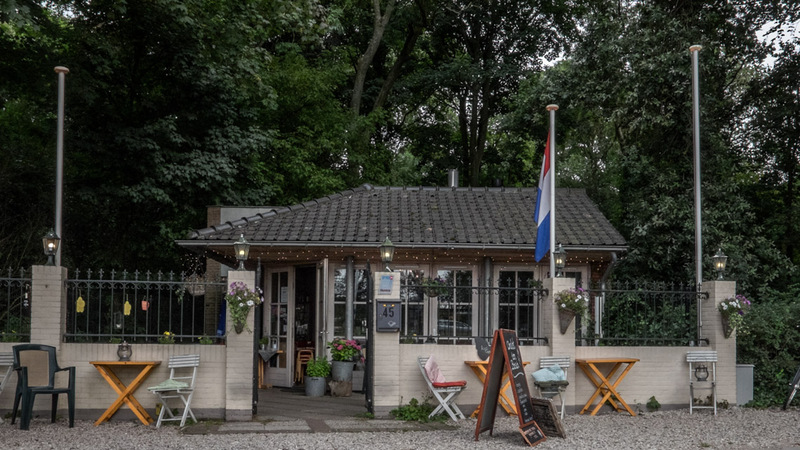 By stopping by the charming Chalet ten Bosch, you can visit one of the oldest and most extensive vintage car collections in the world, and enjoy some lovely refreshments. Hiring bikes is easy and inexpensive in The Hague, and as a favoured form of transport, cycleways are well laid out and signposted. You can hire a bike from central station for €7.50 per day, complete with a lock and inclusive of insurance. Remember to ride on the right, and aside from that you will find it is quite easy to navigate your way around. Be aware that if you are cycling during ‘rush-hour’ times, the bike lanes are very busy – you need to keep your eyes open and your wits about you! Following Bezuidenhoutseweg away from central station in an easterly direction, almost at the end (it’s quite a long road) on the left hand side you will find the Landegoed Marlot, one set of traffic lights before the junction of the N14. Cycle paths are clearly marked. All pathways in the woods run north to south, with the northern end of the woods contained by the Benoordenhoutseweg. Wander through the shaded avenues of tree lined canals, and see what is lurking in the undergrowth. Or sit awhile and contemplate what may have taken place here many years ago during the era when people went out to get some air in all their victorian finery. As you come to the far edge of the Landegoed Marlot, you will cross a very old and historic bridge. Turning left on leaving the bridge will lead you directly on the cyclepath and past the Louwman Museum. 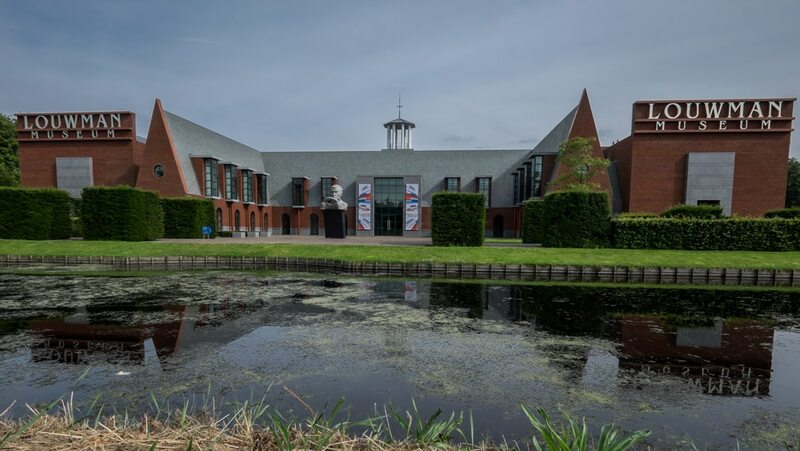 From the outside, the Louwman Museum is quite an impressive building, designed by American architect Michael Graves. The museum is home to the oldest and finest vintage vehicle collection in the world. The museum is open from 10am until 5pm every day except Monday. Once you have lingered amongst some of the oldest cars in the world, and cycled around the Marlot estate, make sure you stop at Chalet ten Bosch for lunch. Chalet ten Bosch, a former coffee house, was designed in the style of a Swiss chalet. It is situated on the edge of the Landegoed Marlot right next to the Louwman Museum on the Leidesestraatweg. A delightful place set back off the road, with Parisien-style chairs and tables outside. There is a beautiful, quiet and peaceful garden, and if the weather forces you to sit inside, you will find a very special atmosphere. Created by the owner of Greek origin, Emilio, here you will feel very welcome. Chalet ten Bosch has been run by Emilio for seven years and offers private dining options, in conjunction with a trip to the nearby Louwman Museum. Groups of 7-27 can be catered to by prior arrangement, either during lunch or for an evening meal. The Chalet is open every day for coffee, lunch and snacks without prior arrangement. Almost the best reasons to visit here, apart from meeting the personable Emilio, are the homemade cakes – believe me, they really are worth the visit. After replenishing yourself at the Chalet ten Bosch, head west towards The Hague and you will be back in the Haagse Bos. Several paths running through the woods, past the lakes and over the bridges, are clearly marked. Handy trail guides are posted in several locations around the woods to help you get your bearings. Crossing the Laan van Nieuw Oost Indie, still heading west, is the other half of the Haagse Bos, with some great playing areas for kids. When you get to the main road, on the other side of the woods, take the first left, next right and you will find yourself back at central station.